After almost two months since the November elections, the five parties that passed the threshold to parliament have found it difficult to agree on a government coalition. The apparent deadlock is predictable, in the sense that Liberal Party was known to be a difficult partner and not going to give in as easily as it did on previous occasions. It was expected that Liberals were going to play hardball. They are, after all, not only in a good position, but also have every right to do so. Liberals have been a troublesome, yet still obedient junior coalition partner for three and a half years, before they fell prey to a PLDM-PD spat in the spring of 2013. Ghimpu, and what is left of his team, know better than accepting to play third fiddle for another four years. Liberals, emboldened by their modest, but promising success at the polls, decided to go all in and not let PLDM and PD have their way. Bearing in mind that the outgoing coalition left behind a long list of failures (shady privatization deals, no state budget approved, three banks running the risking of bankruptcy, continuous currency depreciation, no tangible improvement in the rule of law or fighting corruption etc.) gives liberals the upper hand in the current coalition talks. Again, unsurprisingly, PLDM and PD do not want to hear PL’s lectures and cannot possibly accept any fault for the abovementioned failures. This is high politics after all. Furthermore, PLDM and PD have an ace of diamonds up their sleeve – the Communists. PCRM is desperate to accede to power in any way possible in order to have any hope of survival. Otherwise, staying in opposition along the Socialists poses a serious threat to PCRM’s future as a party. Socialists are at the top of their game and may lure disillusioned communists, should PCRM remain out of power and the perks that come with it. Thus, a deadlock was imminent as long as liberals have a strong bargaining position with only 13 seats to offer, whereas communists, threatened by Dodon, are very weak, but avail a sizable faction of 21. Besides, PLDM and PD are simply fed up with the Liberals trying to position themselves as morally superior to the other parties. Nothing is more annoying that having your own allies criticize you in public – democratic values are nice, but really difficult to live by. Ironically, it came to the point that Ghimpu was ready to give up his idea of becoming president, only to use that as leverage when demanding to be granted the office of Prosecutor General in order to bring in a foreign expert to do the job. He was well aware that the idea was not going to be welcomed by the other two parties, which almost leads us to believe that Ghimpu is perfectly happy with staying in opposition till the next election. The prospects of a PLDM-PCRM-PD coalition are indeed very much in PL’s long term political interest. PLDM’s association with the Communists, coupled with the unavoidable future policy failures, will offer PL at least another 5% of the vote in the next election. This is why PLDM finds it so difficult to openly admit the rapprochement with the Communists and prefers, along with PD, to make a scapegoat out of the Liberals. 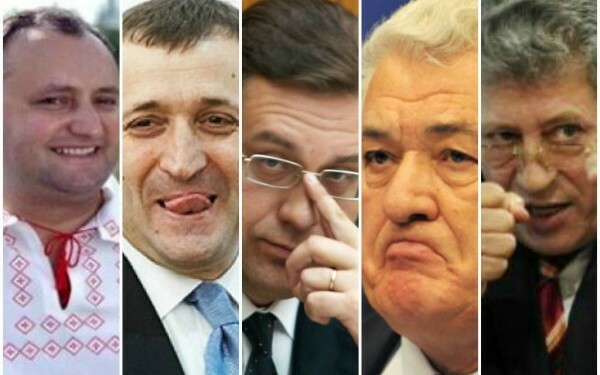 Democrats have less of a problem, in fact many of their supporters are in favor of a so called ‘national unity’ government, besides Plahotniuc’s media machine is instrumental in bringing home the message that unity is as all the country needs. There is a modicum of truth in that, but when PD and especially PLDM talk about national unity while labeling the biggest faction in parliament as the fifth column, they are inconsistent to say the least. In theory, a PL-PLDM-PD coalition may be slightly more desirable, yet a PLDM-PD-PCRM coalition is not really all that different. For reasons explained above, a PCRM backed minority government seems the most likely option. However, knowing the track record and the history of personal relations among leaders of these parties, any potential coalition is in many ways a recipe for disaster. Different actors – the same script. This entry was posted in minority government, Moldova, New Goverment and tagged coalitie PLDM-PD-PCRM, Dodon, Filat, Ghimpu, government coalition, PCRM, PDM, PL, Plahotniuc, PLDM, Voronin. Bookmark the permalink.